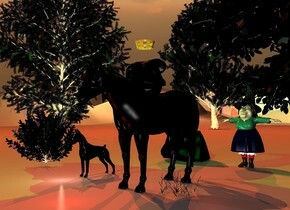 a black horse.a 3 feet tall elf is -33 inches above the horse.the elf is black.a red light is in front of the horse.a green light is above the elf.a witch is 5 feet behind the horse.a gold crown is 7 inches above the elf.a black dog is 3 feet left of the horse.a first black tree is behind the witch.a second black tree is 20 feet left of the first tree.a third black tree is 20 feet behind the second tree.a first rust light is above the second tree.a second rust light is above the third tree.the sun is old gold.the ground is 130 feet tall.a black bush is 3 feet left of the dog.a black rock is 1 feet left of the witch.black grass is right of the horse.the grass is 1 feet tall.a lime light is 4 feet in front of the second tree.a white light is in front of the dog. There is a tower. 10 pirates are 10 feet on the left of the tower. They are facing right. 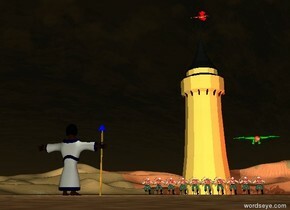 A small red dragon is above tower. A green dragon is in front of tower and 20 feet above ground. It is facing left. Big fire sphere is on the left from dragon. It is evening. Man is 100 feet on the left of the pirates. He is facing right. Bright red light is behind the sphere. A 5 feet tall gold stick is 2.5 feet in front of bathrobe of the man and on the ground. Blue small pyramid is on the stick. Another azure light is 1 feet above the pyramid.